Defensive, vain, simultaneously over the top and excruciatingly subtle, Blanchett—and Allen—have fashioned the most sublime creation of both their careers. Jasmine arrives in San Francisco in a fragile mental state, her head reeling from the cocktail of anti-depressants she's on. While still able to project her aristocratic bearing, Jasmine is emotionally precarious and lacks any practical ability to support herself. She begrudgingly accepts work as the receptionist in a dentist's office, where she attracts the unwanted attentions of her boss. In L.A., on a layover, I went to a morning screening of Midnight In Paris in Westwood. It was the new Woody Allen film. I felt like a dog who has developed learned helplessness, having dutifully made pilgrimages each year to each new Woody Allen, and year after year of tense hope, of thinking, ‘Just one more! One more good one!’ emerging from the cinema slightly devastated. This new one worried me a bit. The title, mainly. But I still hadn’t given up. As I did annually, I caught my breath when the familiar, exquisite white Windsor font on black background came up on the title cards accompanied by an old jazz recording. It was still before noon when the film ended. The audience, quite sizeable, considering, erupted into ecstatic and prolonged applause. It felt like applause of relief as much as anything. He’d done it. It is Woody Allen’s fifth decade of making films and he is unequivocally America’s foremost director. Since 1966 (pretty much), he has released at least one film a year. For a while there, it seemed that every other year would bring an indisputable classic, alternating with one that was not quite classic. Good, but not his best. But on the off years, all that meant was that next time there would be one that would leave you euphoric. Year after year after year. Since 1966, Allen has made 18 solid masterpieces, movies in the pantheon, 10 very good ones, 9 good but slight, and 8 or 9—and I hate writing this—stinkers. It just seemed like there were more stinkers because they all came at once, and recently. But we forget that in 1983 we had Zelig, and just the next year had Broadway Danny Rose, and then the next year The Purple Rose of Cairo, and then Hannah and Her Sisters. We were glutted. And he’s still doing it. A film a year. A director twenty, thirty, forty, fifty years his junior couldn’t do that, not even making crappy films, let alone making films with exquisite performances (even the stinkers), nuanced dialogue, and shot by the most brilliant cinematographers on the planet. Oh, but those 8 or 9 bad ones. It was bewildering to us who set out on our pilgrimage. What happened? It was, it seems, a diabolical alchemy of Allen losing not only his faithful and sturdy producer, Jean Doumanian, in an ugly split during Curse of the Jade Scorpion (the film that marked a decade when it went all wrong), but also losing his studio, Orion Pictures (the offshoot of his old studio, United Artists), which folded. Orion and UA had been key to Allen’s oeuvre, studios that kept him stabled, gave him money (modest, but regular), and let him do whatever he wanted to do, which is what he does best. And every great actor in the world lined up (still do) to be in one of his films, willing to work for scale just for the privilege. Sometimes Allen’s films lost money, but sometimes they made lots of money. But Orion knew, and they cared, that they were harbouring an artist. As a filmmaker, Woody Allen had become homeless. It’s not easy to make a quality film every year, but it’s easier when you have everything in place—not only producers Doumanian, Charles H. Joffe and Jack Rollins, but also Juliet Taylor doing casting, Santo Loquasto doing production design—and especially a studio that kept the money flowing but proffered no creative meddling. But when you have to start from scratch each time, it’s near impossible. And Allen doesn’t make opiates like Avatar or Fast and Furious or Pirates of the Caribbean. As far as I know no Woody Allen film has ever had a Happy Meal tie-in. Who wants to take a chance for potentially little—comparatively—financial return? United Artists and Orion were started by artists, by filmmakers, intent on keeping creative and monetary control (D.W. Griffith, Charlie Chaplin, Mary Pickford, and Douglas Fairbanks started UA; dissatisfied UA film producers started Orion. Film people want to be behind the next Woody Allen movie; corporations want to be behind Teenage Mutant Ninja Turtles 2). Woody had to scrape, getting older, standing less chance than a new film school graduate with a high concept about zombies or cheerleaders or vampires causing digital apocalypse. So, Say Anything, Whatever Works, Hollywood Ending…this is hard to list, like PTSD therapy. There were some bright spots, in the lost years, though dim bright spots considering the glut of excellence that had gone before. Pinpricks, really. But I prayed for just one more classic, because we didn’t know that the last classic would be the last classic. We weren’t prepared. And, this is horrible, but there will be a time, a bleak, hollow future, when there won’t be another Woody Allen a year. Hence, after the final credits of Midnight in Paris, spontaneous applause by strangers in a dark room on a Tuesday morning. This isn’t reductive, or any accusation of derivation, because when you’re talking about a mother lode of artistic excellence, really, how can you complain? Do we say to Van Gogh, ‘Oh. Great. Sunflowers again?’ It’s also Streetcar Named Desire, like Purple Rose of Cairo was Sherlock, Jr., or like Stardust Memories was 81/2, or like Interiors was like an Ingmar Bergman boxset. 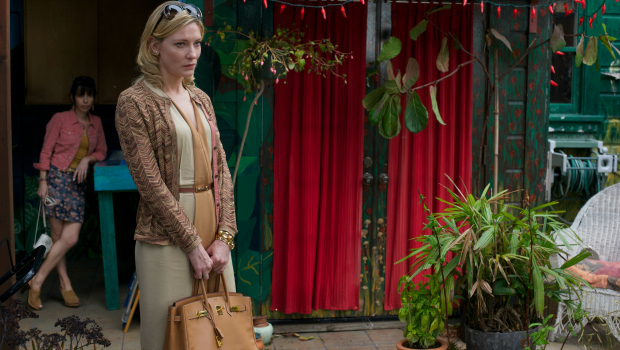 Blue Jasmine is Allen’s gift to Blanchett, a showcase more generous than any of his other films have been to actresses. It is the role of a lifetime, and the performance of the year. Jasmine (Cate Blanchett) arrives in San Francisco, broke, betrayed, and alone to stay with her estranged adopted sister, Ginger (Sally Hawkins). Jasmine still acts rich, though she isn’t, and Ginger acts poor, even though she’s now richer than Jasmine, and will never be rich because she’s a loser. Forever fragile, Jasmine’s reality testing has always been so porous that years earlier she had shed being an orphan—and Ginger’s sister, for all intents and purposes—and became a socialite morphing from a gold digger named Jeannette into being Jasmine, an arriviste. She snagged a rich man, Hal (Alec Baldwin), a high-finance money-spinner, and maintained, for a time, an oily grip on a fantasy that only she herself believes. But it’s less cold-blooded calculation than symptomatic of delusional Histrionic Personality Disorder; she can’t stop inventing, bowdlerizing her past and her present seemingly at whim. Jasmine’s world is a one-woman show and, she believes, everyone else is just an extra, from the woman seated next to her on the plane in the first scene, to whom she candidly discusses her marital relations, to giving her squalorly nephews advice on tipping in Upper East Side Society and what a woman is really looking for. Ginger is equally but inversely flawed; instead of delusions of grandeur, Ginger has delusions of worthlessness, just a case of ‘bad genes.’ Ginger aims low, cheerfully accepting that she doesn’t deserve anything but a life of bagging groceries, a crappy apartment (in reality, her apartment in San Francisco is far from crappy or cheap. That size of rooms, even on Van Ness? The rent would be astronomical), and seeking the simian love of loutish men, notably Chili (Bobby Cannavale, in the Stanley Kowalski role). Jasmine may have had eccentric charm in the hermetic world of the upper echelons of Park Avenue—a place where haughty, narcissistic self-absorption is not seen as a drawback but instead is the lingua franca—but without the bolster of wealth and indulgence, her solipsistic whims are seen naked, and they become what they really are, madness. We saw it in Blanche Dubois (Streetcar Named Desire), and there’s also a little bit of Little Edie from Grey Gardens in Blanchett’s delivery. Jasmine, with Ginger’s feeble help (as kind-hearted as she is, Ginger can’t even begin to comprehend someone as complexly damaged as Jasmine), tries to make a life for herself, deciding to ‘learn computers’ in order to get a job as a ‘designer,’ something that fits a woman of her delusions. Instead, blind to her own circumstances, she has to settle for being a receptionist for a dentist who mistakes her desperation for availability. No money, no husband, no survival skills, an estranged son, and a tenuous living situation (and further muddled with Xanax and Stoli), she sets her sites on a diplomat—or more importantly, being the wife of diplomat—but her undoing is not over. Oh, how Greek this tragedy turns out to be (I forgot to add a decimal point of Mighty Aphrodite into the previous equation). Her downfall isn’t down to bad luck, or the financial crisis, it is the unalloyed result of her own flaws. Never cross a Histrionic Personality Disorder! Blue Jasmine is Allen’s gift to Blanchett, a showcase more generous than any of his other films have been to actresses (and those were mighty generous; he has the best Oscar:actress ratio of any director alive). It is the role of a lifetime, and the performance of the year. Defensive, vain, simultaneously over the top and excruciatingly subtle, with a spontaneous brush of her chin or a reflexive second-long averting of her eye, Blanchett—and Allen—have fashioned the most sublime creation of both their careers. It was the summer before I turned 15. I was staying in Calgary with my cousin for the summer. One afternoon, instead of playing foosball, I walked a couple of miles to the nearest mall to see a film. Annie Hall was playing, and I was struck by the poster. It didn’t look like a slapstick comedy, the kind of film I associated with the name Woody Allen. I had seen movies before, but I’d never seen one that challenged the way movies were told, that used humour to invoke sadness and loss, and alienation and loss to create humour. I didn’t know movies could do that. It was the first truly adult film I’d ever seen, or at least that I’d understood. It was time; I grew up that afternoon. It was that watershed, that movie that hits when you are at the horizon of being a grown-up, when you become an individualised sensibility; that movie that becomes yours. That movie that makes you fully and forever devote yourself to film. That happened for Allen, I believe, with Ingmar Bergman. That happened for me with Annie Hall. And every year since then, like milestones in my life, like stations of a cinematic cross, that initial discovery, that pilgrimage. And with Blue Jasmine, it feels like redemption.